The Shoulder – The joint which exchanged its stability for mobility. So we have the most advanced hands of all living species, but what good are they without an efficient shoulder? Its easy to think of the shoulder as the GlenoHumeral (GH) joint, it becomes harder seeing it as a ‘shoulder girdle’, or a ‘shoulder complex’. There are 3 other equally important joints involved which help provide movement and mechanical support to our arm movements. It is important to know each of these joints have their own capsular pattern, planes of movement and axis’ of rotation. Coordinated movement ensures harmony in motion. A reduction of mobility, strength, stability or coordination in any of these joints or their surrounding muscles can result in altered kinematics, leading to tissue damage and pain. In this first section we will create a basis of knowledge by considering the GH and ST joint. 1. Slide/Glide – Translation along the plane of the glenoid cavity. 2. Spinning – Rotation about the humeral axis. 3. 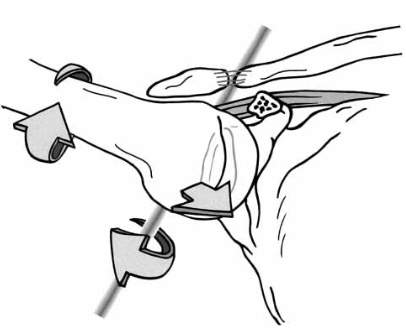 Rolling – Movement of the humeral head about an axis (shown) perpendicular to the humeral shaft. Too much of this and too little translation, can result in the dysfunctional movement – ‘hyperangulation’ (described later). There are many ways arthrokinematics (movement within the joint) and osteokinematics (movement between bones) can be altered in structure and function. Pathology begins with the improper structure or function of the above, view other sections for more.